Increase the available space at your property while also improving its market value with the addition of a bespoke conservatory. A Room With A View is a company based in Dorking, Surrey, specialising in the provision, supply, and installation of bespoke conservatories. Our vastly experienced team deliver a reliable service that includes managing the design, planning and execution of each conservatory installation. We provide the expertise and materials, including conservatory glazing, to create market-leading products that add style, functionality and value to any property. Our company also offers a full installation service including base work and a full range of ancillary products for every conservatory. Specialist work is never a problem and our experts are knowledgeable about integrating features into our products, for example box and valley gutters. If required, we can make physical changes to your property in order to create the perfect conservatory. This includes the addition of new apertures, lintel installations and modifying your current drainage system. All of our products are created on a bespoke basis and our company has already installed many conservatories for homeowners in the Surrey area. A Room With A View gives customers full design choices from our wide range of gable, lean-to, P-shaped, T-shaped, Victorian, Edwardian and orangery conservatories. When it comes to producing hardwood conservatories, we use high quality materials, fully factory finished with preservative base coats and top coats in microporous stain or paint in a range of standard colours. Because our hardwood arrives to site fully prepared, it withstands the adverse weather conditions and the manual handling required during a conservatory installation. 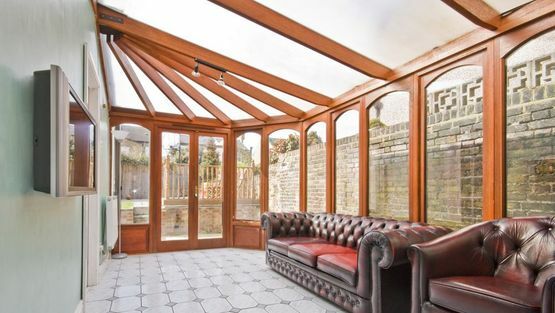 Once we’ve erected a conservatory, we simply 'touch in' exposed parts of the paintwork to maintain a superior finish. If you would prefer a unique finish, we offer a full range of RAL colours at an additional cost. A Room With A View has supplied and installed PVCu conservatories since our inception in 1988. We produce each conservatory from top-of-the-range Rehau materials that exceed current industry guidelines and recommendations. The conservatories are fully structurally reinforced to ensure wind and snow loading do not cause a problem. To suit your style preferences, our PVCu conservatories are available in a range of standard colour finishes and we also offer a full range of RAL colours. We normally use the Ultraframe roof system which is widely known for its structural strength and quality. We can also offer thermally-broken aluminum roof systems. Contact us now, in Dorking, Surrey, for more details about our bespoke conservatories and conservatory glazing.